It should be July 2 of course. That is when the delegates to the Second Continental Congress, meeting in Philadelphia in the summer of 1776, voted "independency" from Great Britain by adopting the resolution offered by Richard Henry Lee of Virginia. 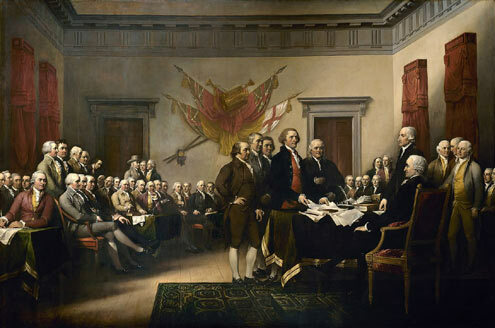 The momentous deed done, the debate turned to the document that would announce this decision to the world, The Committee of Five's Declaration of Independence. The committee, Thomas Jefferson, John Adams, Benjamin Franklin, Roger Sherman, and Robert Livingston, had been at work on the declaration since June 11, with Jefferson taking the lead as its principal author. Their final draft had been before the delegates since June 28. The debate on July 2 was short, but two more days of discussion followed before the amended declaration won approval on July 4. The delegates, most of them at least, did not sign the document until August 2. The first celebrations of independence followed whenever people learned of the event. The first public reading of the declaration came in Philadelphia on July 8. Williamsburg, then the capital of Virginia, got the news on July 25. The next day theVirginia Gazette reported the reading "at the Capitol, the Courthouse, and the Palace, amidst the acclamations of the people." The acclamations included a military parade and the firing of cannon and muskets. Newspapers all over the colonies carried stories of similar demonstrations when the word arrived. In New York, the "Declaration of Independence was read at the head of each brigade of the continental army posted at or near New York, and every where received with loud huzzas and the utmost demonstrations of joy." The New Yorkers took things one practical step further. 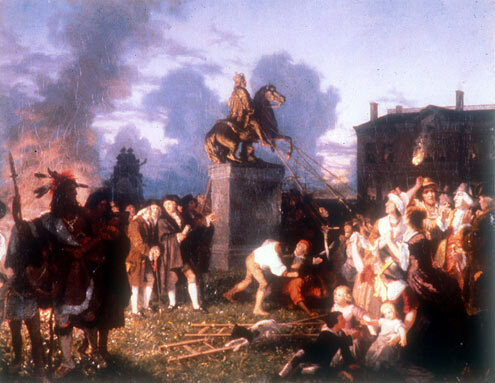 They pulled down a lead equestrian statue of George III and hauled the monument off to be melted into bullets. Things really got going a year later when Philadelphia organized the first more or less official Independence Day celebration. Cannons fired, bells rung, music boomed forth; there was a parade, fireworks, and a display of patriotic colors on ships in the harbor. The music came from a Hessian band captured in Washington's assault on Trenton the previous Christmas, and congress, as always first in line when the good stuff is passed out, attended a gala banquet. "Thus may the 4th of July, that glorious and ever memorable day, be celebrated though America, by the sons of freedom, from age till time shall be no more, Amen and amen." (Virginia Gazette, July 18, 1777) And so it was. Two paragraphs up, the term "more or less official" came into play. There is a reason for the equivocation. There are no officially designated national holidays in the United States. There never have been. Congress sets aside federal holidays, closes up shop and lets the government workers take the day off, but congress has no say as to what the individual states observe. In practice, the states adopt the federal holidays as their own, but they are not required to. Massachusetts led the way when it designated the Fourth as a holiday in the Bay State in 1781. Boston was the first city to sanction the occasion in 1783, and that same year, Alexander Martin of North Carolina was the first governor of a state to proclaim the day as one of celebration. The government in Washington did not get around to marking the event until 1870, when congress allowed government employees a day off without pay. Wherever Americans were, in cities, small towns. or out on the fringes of civilization, the Fourth of July has been a day for fun. John Adams predicted as much in a letter to his wife Abigail on July 2, 1776. He erred in believing that date would be the one noted, but other than that, he forecast what was to come, suggesting that future generations would remember the day as "the most memorable Epocha, in the History of America" and celebrate it as their 'Day of Deliverance by solemn Acts of Devotion to God Almighty.' It ought to be solemnized with Pomp and Parade, with Shews (Shows), Games, Sports, Guns, Bells, Bonfires and Illuminations from one End of this Continent to the other from this Time forward forever more." The pomp and parade, from homemade affairs such as the kids' bicycle parades that run through local neighborhoods, to the big city extravaganza such as the parade down Peachtree Street that has been the center piece of celebrations in Atlanta, Georgia for the past couple of decades have always been a big part of the Fourth. In the old days a few musicians, local militia company and a collection of children to watch and participate with wide-eyed wonder was all that it took. Adams "shews" often took the form of patriotic tableaux or pageants with stirring declarations and public readings of the Declaration of Independence. One of the first on record was musical drama The Fourth of July or, Temple of American Independence, which premiered in New York City in 1799. It was a day for sporting events. Shooting contests were popular in frontier America as were wrestling matches, tugs-of-war, and racing, both foot and on horseback. Early on, the sports were participatory, but after the Civil War, a new craze swept the country and took its place as a staple of Independence Day activities - baseball. In towns large and small, in great parks and diamonds scratched out of the tough soil of the prairies, baseball was the game. The big leagues, the minor leagues, the local town and industrial teams "they all cracked into action when the umpire called 'Play ball'"
Explosions are an important part of the Fourth. With cannons and firecrackers and everything in between going off, July 4 has long been a noisy day. A favorite activity in early America was anvil shooting. Black powder was tamped into a hollow stump, and the hole covered with a heavy anvil. Boom went the powder, and the anvil went flying through the air. As anvils suffer no adverse affects from this treatment, it can be done again, and again, and again. They still shoot anvils every year in Laurel, Mississippi, although they do it in April rather than July. That may be left over from another Mississippi city's refusal to take any note of day for eighty-one years. The city was Vicksburg, and on July 4, 1863, Lieutenant General John Pemberton, C.S.A. met Major General U.S. Grant, U.S.A. under a battered tree and surrendered the city and its garrison after a prolonged siege. The citizens of Vicksburg took no special notice of that date again until 1944. In recent times, the Fourth has become, as have so many of our public observances, more commercialized and less home-made, and the essential meanings of the day have been muted. Still, it is a time when enjoy and take advantage of the liberties demanded, secured, and defended over the years by the citizens of the nation born in 1776, even if we too often fail to give consideration to those liberties and what they cost. So this Fourth, give out an huzzah, celebrate our independence, but also give a moment to consider the price paid by those who handed it down to us, and who would fully expect us to preserve it for those who will come after.